A simple smile can change the world. We all suffer from hard times, times when it feels like the whole world is against us, times that we hate our lives, times when every message seems to be about hate and suffering. Well it's about time that changed. Equilibrium is proud to launch the "Love | Life" campaign. A stand against hate and suffering. It's difficult to be happy when all you see, hear and feel is hurt, pain and suffering. And yet it takes so little to make a positive change in your life, a change that reflects on others. A simple smile can change the world. Dog tags have forever been synonymous with soldiers and war. What better way to spread a message of love and life than to reclaim a powerful symbol like dog tags for positive use? Being part of the "Love | Life" campaign is about striving to be happy, about spreading joy and generally loving life and helping a good cause while you're at it. It's not just about mental health, sexuality, racism, religion or war, it's about life. I'd love to be a part of "Love | Life" but I'm not really into wearing dog tags! No problem! Even though most people will wear the dog tags around their necks, there's nothing stopping you from being more creative. You can stick them on your key ring, on your bag/purse, even dangling down from your rear view mirror if you have a car! Talk about versatile! 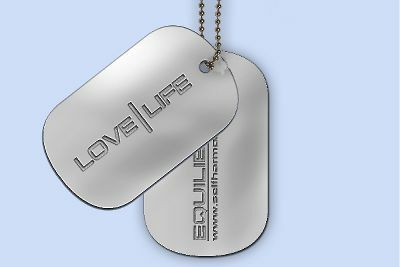 Purchase the official "Love | Life" dog tags here. Only available from Equilibrium and GATEKeeper Online. Bought some merchandise? Send in or upload your photos to the Awareness Gallery.